A few weeks ago, we came to meta with an idea called Teams. For those who didn’t read the first post (we can’t blame you: it was a long read! ), the idea behind Teams is to give users of Stack Overflow a way to showcase their team projects and achievements on a shared page and check out what other teams are building. We also shared longer term ideas for Teams, including Q&A, job openings, and — yes — following (more on that below). First, we’d like to thank everyone who took the time to add answers and comments, or sign up for the private beta. Your feedback is valuable and we appreciate it. There were a number of questions and concerns, and we’d like to address those here. … A majority of your programming work is done as a Team. Individual user profiles have trouble reflecting this (after all, your profile is about you). With Teams, we’d like to make it easier for you to show your association with others on the projects you work on. … Your programming work isn’t mono-dimensional. You probably have a day job, but you may also contribute to one or two open-source projects, or be a member of a handful of user groups or communities. With Teams, we’d like to give you an easier way to represent your role in all these different things in a more structured way (rather than flattening all this information in your individual profile). In their initial iteration, a Team will simply be a page on Stack Overflow where a group of developers can tell the community about who they are and showcase their best work. Just like a user profile, but for multiple people (i.e. a free form about section, links to your website, GitHub, Twitter, and a team roster). We envision Teams to be used for professional teams, open-source projects, user groups, or even programming communities endemic to Stack Overflow working towards a common goal (e.g. organizing question lists, analyzing Stack Overflow data, writing bots, etc.). So far, it’s encouraging to see that a wide range of teams that have signed up for the private beta. We’ve had companies (some large, some small), major open-source projects, single-person OSS projects (e.g. YouCast), user groups (e.g. Git, Docker), and even Stack Overflow communities (e.g. sopython). My team already has a company or project website. In any case, that’s fine: Teams are functionally and socially optional, and you won’t need to be a member of a Team to participate on Stack Overflow (you don’t have to check out anyone else’s Team, either). Regarding authenticity, it’s already a hypothetical problem on Stack Overflow (e.g. you can easily pretend to be Guido Van Rossum if you want to), but it hasn’t been a practical problem. We realize that just like user profiles, Teams as a feature must be resilient to misinformation and trolling. In the short term, we might surface user reputation on Team pages as a solution to communicate trustworthiness. In the longer term, we’d like to explore other ways to establish trustworthiness for Teams (maybe including "verified" Teams), but it’s too early to talk about those in detail. What about teams disparaging other Teams / offensive content / spam? The same argument applies here as well. Users can already disparage others and post offensive content on their user profile, but this hasn’t been a major problem on Stack Overflow so far. For the most egregious cases (i.e. offensive content), Teams will have to support some form of flagging and moderation. We still have some work to do here (and we need to ensure we don’t create more work for our moderators), so we’re not quite ready to discuss the details. As far as the private beta is concerned, we’ll take on moderation ourselves. Moderation tools will however be an integral part of our work as we move towards public beta. What about conflicts within teams? Dealing with conflict is inherently a personal thing, and it’s difficult to anticipate how we’ll deal with conflicts we haven’t seen yet (and maybe they won’t even be a problem — one can always hope!). Either way, we understand that this is probably a problem we’ll have to deal with sooner or later. We think it’s reasonable to go into private beta without a more detailed strategy (as noted above, we’ll take on moderation ourselves for now), but we’ll make sure to return to meta and discuss this before we launch into public beta. Can you be a member of multiple teams? Is this for Stack Overflow only? For the time being, yes. We’ll consider expanding Teams to other Stack Exchange communities based on how successful it is on Stack Overflow. No. One fear that was raised in the comments was that Teams introduces a way for users to form around non-programming interests on Stack Overflow. While these interests may apply to a wide range of developers (gaming, books, movies, etc. ), that is not our intention with Teams. Our intention is that Teams will form around programming-related groups (companies, open-source projects, or programming communities endemic to Stack Overflow). We don’t want to encourage groups which form around non-programming related topics (that’s what the broader Stack Exchange network is for!). If this becomes an issue, then we will address it. Okay. Now as far as "following" goes, this is a mistake on our part; we jumped the gun here. Originally we thought of “following” as a feature we might introduce later on if we added Team job openings. That is, if you’re interested in a Team, then you could be notified when they post new jobs. At some point we started thinking that "following" could be expanded to possibly other team content. To be honest, we didn’t really think it all the way through; thanks for bringing it up in the meta responses. Following won’t exist until we have job openings on Team pages (more on that below). Once we do, following (which is probably not the best name for this feature) will only be used to be notified of new openings. We don’t have further plans around following at this time. How is Team Q&A going to work? Judging from the feedback we received on Team Q&A, we realize we have a lot more thinking to do (e.g. a better idea of what content is acceptable and why, a plan to ensure Teams aren’t used for spam, a strategy to address abandoned Teams). Team Q&A wasn’t going to be a part of the beta (we hoped to ship it in Q1 next year), so we have time to revisit and perhaps rethink it (maybe with an emphasis around product and end-user support). In hindsight, we probably should have made that clearer in the initial announcement. Team Q&A may be complex enough to deserve its own beta. We’ll return to meta when we have thought through some of the issues surrounding it. Once again, thank you for highlighting the issues we need to explore further. Is this an attempt to integrate the Careers product with Stack Overflow? 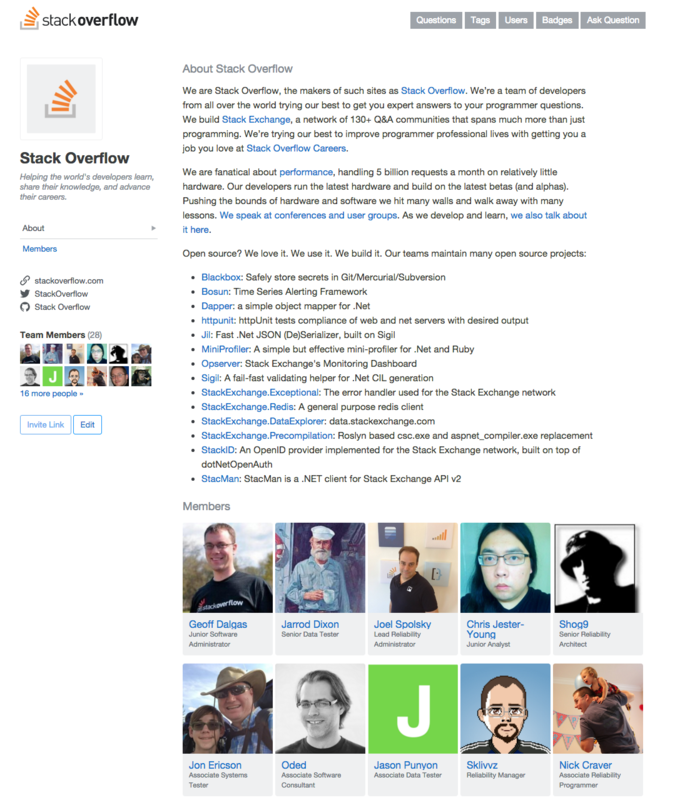 If you’ve been around Stack Overflow for a while (even a short one), you probably noticed a few folks you admire. If they took the time to fill out their profile, you might also know what they work on, and you might even want to work with them if the opportunity arises. On the flipside, they might be looking to hire someone like you (they might even be hiring on Stack Overflow’s Careers platform). But, you don’t know that, because developer hiring is broken, and relegates to an afterthought some of the things that matter the most in a development job: who you’ll work with, and on what projects. Teams is thus our attempt to cut to the chase and let you start your job search with a team and its projects (which is a bit similar to how you might become interested in a job at a conference or meetup, after watching someone present their work). In that regard, Teams are something we’re building upon the foundation of Stack Overflow Q&A. They don’t change Q&A. Teams are something new that you can decide to be a part of if you’d like, but we won’t expect you to be a member of a Team in order to participate fully in the Stack Overflow Q&A you love. Nonetheless, we do realize that many of you are concerned that pain points in Q&A aren’t getting solved because our engineering resources are diverted towards projects like Teams. We agree, and it’s why we’re transitioning members from the Careers team to the Core team to help work on those new projects (Roberta was our first developer to transition, I did so too). That’s all we have for now. I’m sure there will be more questions and comments. As we move into this private beta phase, we’ll learn more and have more answers for you. Once again, thank you to everyone who’s provided feedback so far. We appreciate the passion you have for Stack Overflow and its community. You can still sign up for the private beta. I read your post and got a much better idea what problem "Teams" should solve. However, all you are writing about is showcasing work and displaying (open source) projects. If this feature was named "Projects", some of the concerns raised in the comments would be better addressed. Is Stack Overflow becoming a social network? No, we care about content more than people. In case you want to show your affiliation with an organisation, you can still put that in your (careers) profile. You still haven't answered what problem you are trying to solve, you've only addressed what Teams is meant to do. How will Teams benefit me? How does showcasing projects and achievements break down? What do you mean "break down"? Obviously the content is visible and rendered correctly. So what do you mean by "break down"? What goal is unachievable, considering there's enormous flexibility to include links, images and a large amount of text? And how does your solution solve this "break down"? It seems the only usable addition you've provided is the ability to query these relationships, because the "About" page for projects doesn't look that different from the "About" page for profiles. What trouble, exactly, is encountered in reflecting that I work on a team? It's not difficult, at all, to add "I work at XYZ" with a link to the company or project website. 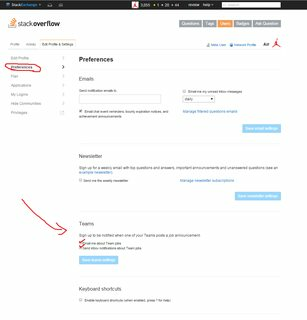 The proposed Teams feature does not have anywhere near the power or flexibility necessary to showcase the actual product (with about, demo and documentation pages) or to manage a team (with communication channels, backlogs, sprints or Gantt charts), so what exactly is the point of the Teams page other than to group some user profiles together? And what problem does that solve? With Teams, we’d like to make it easier for you to show your association with others on the projects you work on. What benefit is there to me to show my association with others? And this only works for other SO profiles, right? Many of my co-workers don't have SO profiles. They aren't interested in SO profiles. So really I'll only be showcasing my association with other SO users. But why do I want to do that? What benefit is there for me? A company or project About page can easily list everyone involved on the project, with links to all of their social media profiles (Twitter, Facebook, Linked In, etc), so how would a separate, more limited and less representative "About" page on a different site help our team? It seems like any marginally successful project (in terms of usage) would quickly outgrow the very limited nature of Teams. Why do I need a more structured representation of my various roles? The use of "structured" points again to the seeming primary point of this project... to build a database. I don't see how such a database would provide any benefit to me. At least on a service like Facebook there is some trade off, in that providing structured data about my social network gives me access to tools that I can use to enhance communication, etc, within that network. Teams doesn't seem to provide any real benefit to its users while giving SE all the goodies... a big database of relationships between users. While I don't necessarily have a problem with that (I like and trust SE, so I'm willing to give you that information), you're going to have to give me more of reason to provide and update this data than just "so you can show off". And more importantly, you're going to have provide some serious incentive if you expect my co-workers who don't have SO accounts to create accounts and agree to keeping our project page updated. Because time we spend on this feature is time not spent on our product. I guess I just don't see "Individual user profiles have trouble reflecting programming work done as a Team" as a problem in and of itself. Individual user profiles also have trouble facilitating conversations between users (though it could theoretically be done). So the question I'd like answered is: What problem are we addressing by creating a structured way of grouping Teams, beyond the problem that it's currently not possible to create a structured way of grouping teams. 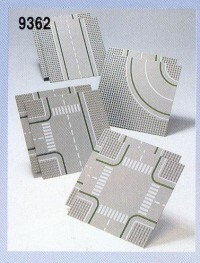 Of interest are the parts that form intersections. And that's what we've got here, along with a lot of talk about what's going to be built there, how it's going to be easy to get to, but not get in your way as you go about getting what you came here to do done. It's new, it's kinda big and we're at the point where we have to tell you that something is coming as we start building it in plain sight. You know everything about it that we do, and we'll make sure that stays true. Maybe it's a new stadium, or a library, or something that town planners have decided is essential in order to bring more people into the town. Whatever it might be, there will always seem like there are more important things we could be doing other than building that thing. What about the potholes a block away? What about all that graffiti on that other side of town? We're not putting any of that off. But we can't put this off any longer, either. Sometimes there is just never a good time to do something and fully respect everyone's expectations at the same time. Core Q&A is never going to become a second class citizen when it comes to the amount of attention and resources we're committed to putting into it. But we really need the foundation for this laid so that a lot of other problems in and beyond Q&A can be solved, so that none of our products function like bolted-on afterthoughts. But there are lots, and lots of things in the air, and not all of them are mutually exclusive. Deciding not to do this right now would not magically give us everything we need to solve other problems, like refining search, beefing up the spam protection layer, or the two dozen other things I really want to work on right now - and I see what I feel are quite a few assuming that we're diverting. That's not the case, we'd be obligated to announce this even if everything else was perfect, please don't read so much into the timing. Things block for many other reasons than hands needed to do them. What we positively must do a better job of, and it's been quite clear for some time (and broadly my fault that I've lagged the last two weeks) is being more responsive to the plethora of requests that we're currently serving in addition to what we're talking about here. .. and more might be coming on this team. Our primary focus has been making sure long-standing and well-received community needs are met, and continue to be met timely. If you're not seeing that, it's my fault, and we'll do better. We can't make super complicated problems magically simple enough to solve in a week, and before we fix problems, we need to figure out how. But (and this keeps repeating, which is something else I'm paying attention to) we can do a better job of letting you know what we know, even if we don't yet know very much. Some problems are just that hard at our scale. Please don't read more into this than there is. It's new, it's big, and we wanted to tell you about it. We didn't wander off into the weeds chasing rainbow uni-squirrels, no matter how excited we seem. But we do have a lot going on, and while we promise to continue to be as transparent as we can possibly be, we humbly ask for your patience and support. I'll be working on a series of posts here on MSO to shine some more light on what team SO has been up to lately, even if it's not as close to shipping as we'd like, because it's pretty clear to me that many would appreciate things like this more if they were more up to speed on the .. less glamorous endeavors that task us. 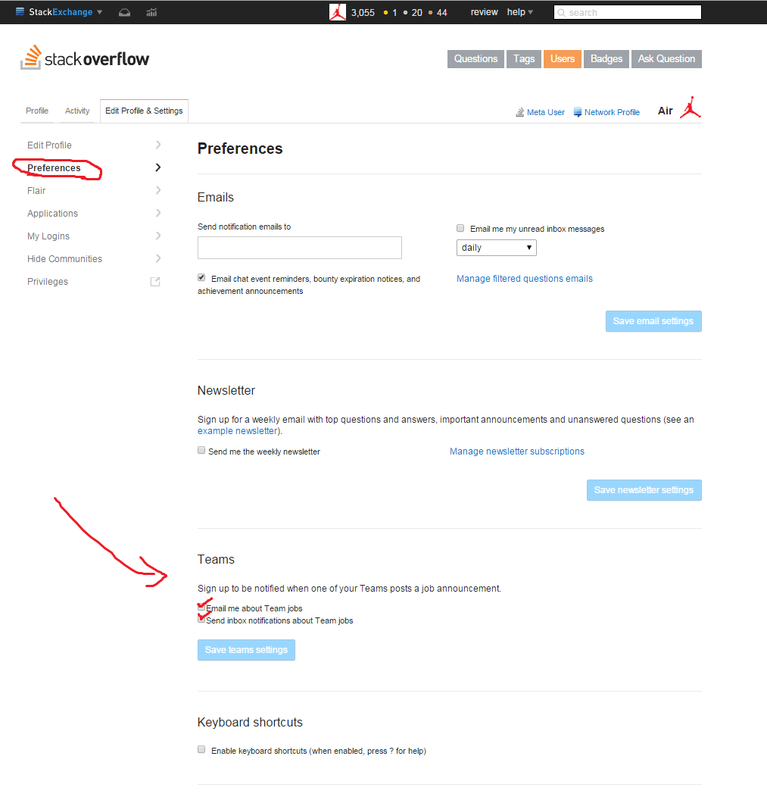 If it's really important that this be discoverable from within a Teams page and/or when signing up for Teams, just instruct users to follow a link to their preferences page to manage Teams notifications. The only thing this doesn't do is let you get notifications from some Teams and not others. You could just as easily do that by adding another section at the same level as "Preferences" (what are these sub-tab things called? drawers, maybe?). throw it into "Applications", etc. I think this is a good feature for those who use SO Careers to have. This would just serve the purpose of giving you the information about people currently involved in a company/project which may make you want to join that project, just like the current system where your profile may make a company want to hire you. I don't think this proposal will cause problems for users who want to use just the Q&A feature any more than existence of SO Careers does. Maybe a team page could show a meaningful aggregate of all this information, and a team "about me". This just adds more information about the people that are involved in Q&A on StackOverflow and I don't think this generates any noise. In fact, These might even work to motivate people to partake in Q&A like reputation and badges currently do. But there is one area where this proposal lacks, which is the abuse of SO Q&A system. "How does [Company X] run PostgreSQL at an enterprise scale?" I think that the concept of asking a personal question to a person or a bunch of persons is foreign for StackOverflow where questions that are allowed are supposed to be answerable by anyone with knowledge in that domain. How do I run PostgreSQL at an enterprise scale with my specific requirements that are included in the question? along with other answers from other experts in that domain. So perhaps one way that the teams feature could help SO Q&A is by contributing to the discoverablitiy problem* - a team may want to subscribe to a specific tag, or may be summoned by a @mention when a question regarding intricate implementation details about a project comes up. One specific case that I do know that this feature may help is the openshift tag. openshift is a PaaS service which closed down their forums and recommended all their users to ask questions on SO instead, with the openshift tag. Maybe cases like these may want to form support teams on SO and subscribe to all the questions tagged about their service and answer them quickly to show off the badges and stats earned by their support team's page as a proof of quality of the support that they offer to developers. Because unlike Q&A that SO is built on, this is more of a Ask Me Anything kind of thing, which I'm not saying is bad, but is just foreign to what SO currently is and is more fitting on social networks. That could be a very cool boost for the by mentorship and personal development as a software engineer, currently receiving too little attention in the SD world in general. If a nice tool was there and maybe support by others would somehow add to this it might be more likely that more people get incentivized to act as mentors. It would also be nice to see an option for people to move from Teams to Teams as Pairs.